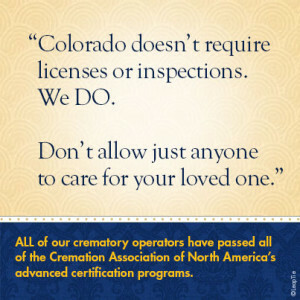 We have been Colorado’s cremation specialists since 1998. 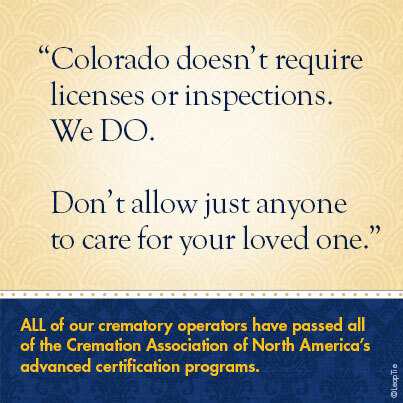 Selecting Cremation Society of Colorado, does not mean you receive less care. From the moment you call us, until every last detail has been taken care of, you will be working with a designated cremation specialist and the staff of Cremation Society of Colorado. Unlike other firms who may delegate portions of the cremation process to third party companies, your loved one is always in our care. We provide all of the above for one price. There are no hidden fees or surprise add-ons. We are here to assist you , please call: (303) 797-6888.